A Collaboration with Elite Series Pro Aaron Martens… The Tungsten Knocker/Heavy Cover brings cutting edge technology to our popular Shock Blade design. 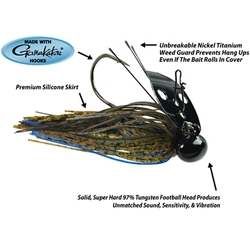 Constructed around a solid, one piece, 97% tungsten football head that creates added sensitivity, generates extreme vibration and hunting action that flat out catches fish. The flexible, three-prong, nickel titanium weed guard let’s you work through cover with fewer hang-ups, while not impeding the hook set and allowing good hook penetration. The Tungsten Knocker makes a great alternative to a crank bait or a football jig and presents them with something that they have not seen or heard before. Ideal for working areas including gravel banks, hard clay bottoms, rocky points, rip rap, submerged wood and off shore humps and ledges. Our exclusive super soft thin sheet silicone skirt material creates fish enticing undulation that is comparable to that of rubber skirt material. Extra long skirt length allows you to custom trim or use without the need for a trailer. Call ‘em home for dinner with the unique sound produced by the blade knocking the tungsten head.